For many, a holiday is simply not complete without some serious beach time. With more than 1,100 miles of stunning coastline and a fantastic climate, California has plenty to offer beach lovers, from wild and secluded surf spots to sunbathing amongst celebrities near LA. As a general rule, the further north you go along the coast, the beaches become quieter and wilder, with some stunning landscape to complement the shore. (Of course beach towns and cities form an exception to this rule.) In a complete generalisation, it would be fair to say that people watchers & sun-bathers should aim for the southern coast, whilst nature lovers and beach combers should go north. Surfers can take their pick all along the coast. The beautiful, sandy beaches aren't just a draw from overseas visitors, however. Domestic tourism pulls in the majority of visitors, from both California and the rest of the US, meaning that accommodation can book out months in advance, especially during the summer holidays, so our advice is to plan ahead. Here is a summary of our favourite beaches in California. 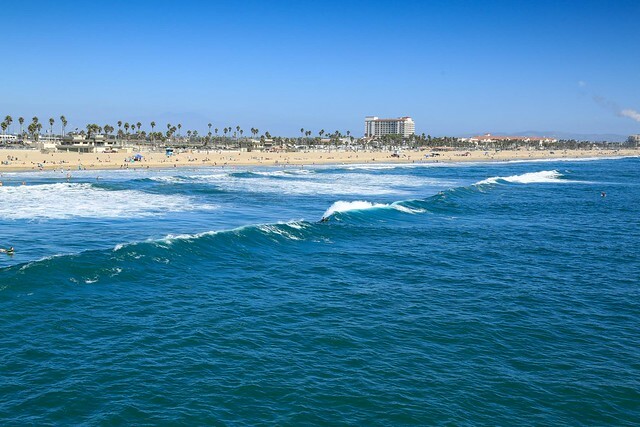 1) Huntington Beach, Orange County The self-proclaimed surf city, Huntington Beach is one of Southern California's gems, with 10 miles miles of long, sandy beaches. It is a popular spot, so can get very busy at weekends, but is a fantastic place to come and sun-bathe or try out the surf, with some of the most consistent waves along the coast. If surfing isn't your thing, then you can splash in the waves and watch the numerous games of beach volleyball along the beach. In the evenings, there are fire pits on the beach, where you can light a fire and indulge in s'mores, a traditional American camp fire treat! Huntington Beach is an easy drive from Anaheim, so is especially convenient for those basing themselves in the area for the theme parks. 2) Santa Cruz Just an hour south of San Francisco, Santa Cruz is a laid back town, with a slightly alternative vibe. The spiritual home of surfing, Santa Cruz has some excellent beaches and also the famous Boardwalk, which features amusements and the famous Big Dipper roller coaster. On the beach, there are body boards and surf boards for hire and it's easy to arrange lessons. Beaches in the town are busy, so if you wnat to avoid the crowds, you may want to get in the car and drive to one of the nearby options with fewer people. 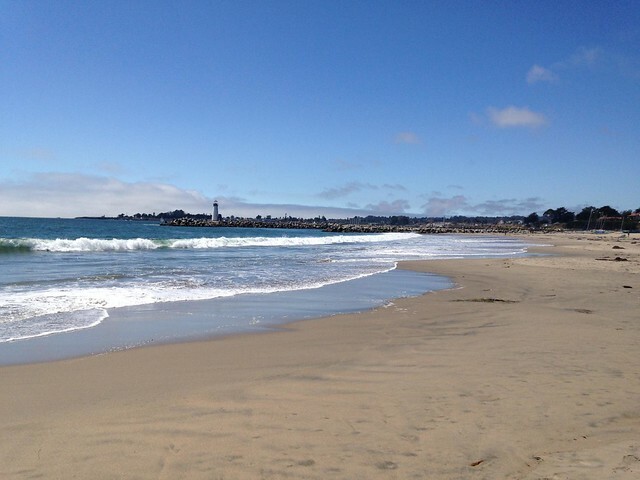 Santa Cruz is a great choice if you want to spend a few days on the beach and exploring the Pacific Highway. Away from the beach, you can go and see some Giant Redwood trees up at Henry Cowell State Park, or drive to Monterery to the aquarium. In the summer months, you may well see the fog that the region is known for; usually worst in the mornings and evenings. 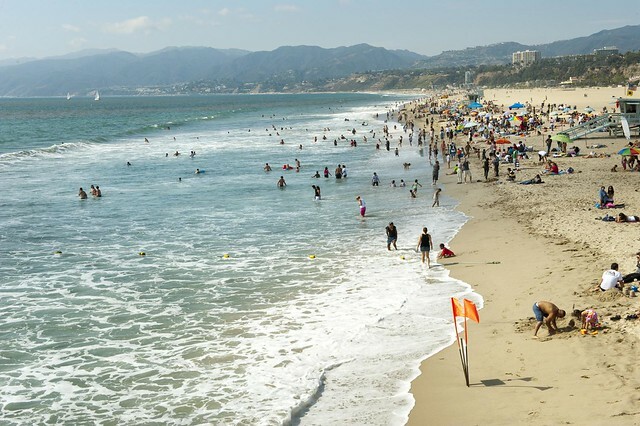 3) Malibu Baywatch eat your heart out, if people watching and celebrity spotting floats your boat, then the beaches of Malibu are where you need to be. These are places where you go to see and be seen, so get your skimpiest bikini and your in-line skates and get ready to strut your stuff. 4) Big Sur Located at the half way point between Los Angeles & San Francisco, Big Sur is a rugged and wild part of the Pacific Coast; the complete antithesis of the people packed beaches around LA. 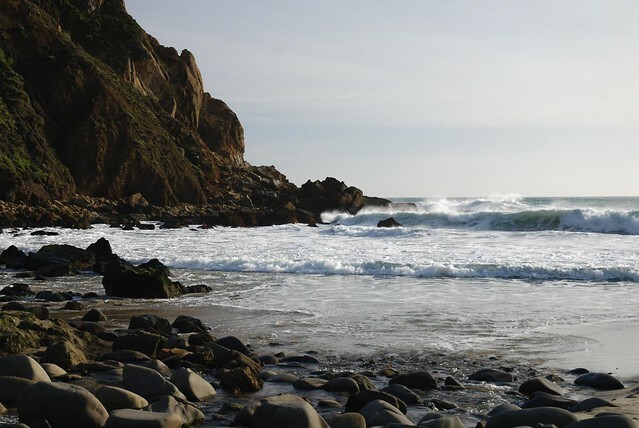 One of the most well-known of the beaches is Pfeiffer Beach, famed for its huge rock formation and crashing waves. These beaches are generally not for swimming - currents and rip tides and no life guards see to that - but they are for hiking, beach combing and feeling the sea spray in your hair! There are a couple of luxurious accommodation options, but these fill up months and months in advance and have a vast price tag. The most economical way to visit Big Sur is to base yourself in one of the nearby coastal towns, pack a picnic and go for the day. 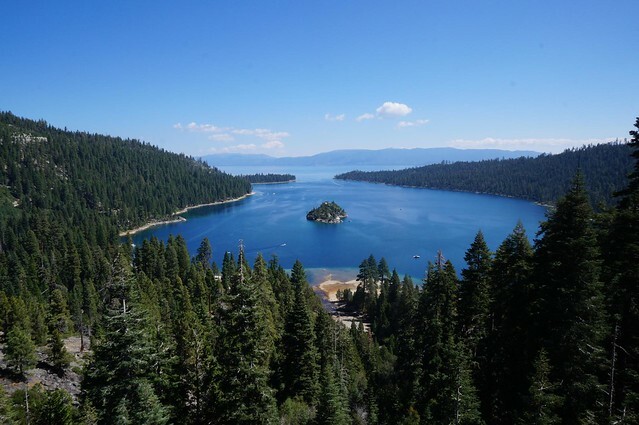 5) Lake Tahoe Yes we know this isn't a coastal beach, but Lake Tahoe measures a massive 191 square miles and is in an enviable location, surrounded by mountains. The calm crystal clear waters and sandy beaches are a perfect location for sun-bathing and swimming and the lack of tides make sit a safe place for children to splash about. Many people are attracted here for the water sports and he calm waters encourage many to try their hands at stand up paddle boarding and kayaking. If you are visiting North California, then Lake Tahoe is an excellent option for some relaxing beach time.